Wear this set 3 different ways, all pieces are separate. This is perfect for wearing multiple ways with multiple outfits. 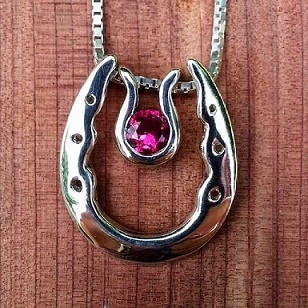 Set includes large horseshoe pendant, smaller horseshoe set with a 5mm synthetic faceted Ruby, and a medium 18" box chain. This set is also available with different stones as well as different metals.